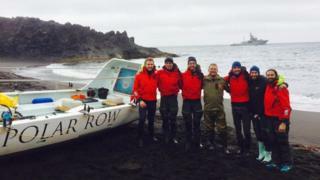 A group of rowers has been rescued by the coastguard from a remote Norwegian island, where they had been stuck for more than two weeks. The crew, including British Olympian Alex Gregory, had been stranded on Jan Mayen since 19 August, a month after starting to row from Norway to Iceland. The group, who were taken to the Norwegian mainland, sought refuge on the island because of ill health. In a post on the group's Polar Row Facebook page, they said: "The Polar Row crew and boat is now on mainland Norway! "Thanks to the great hospitality of the Norwegians on Jan Mayen and the Norwegian coastguard who gave us a lift to the mainland. "It's been an extremely successful trip, although some amendments due to the circumstances, we are extremely happy to have accomplished the expedition." They said the group's injuries were better and Gregory's "infamous" hands - which he pictured on social media on 30 August - were healing and "looking less like he should be in a morgue every day". The crew of nine, which included four Britons and men from Iceland, India, the United States and Norway, are now due to fly home. They were looked after by the Norwegian military on the island while they awaited rescue. In a Facebook post, Oxfordshire-based Gregory said it had been "one extraordinary month, something unexpected and interesting at every turn". "Hopefully now the flights are simple and straightforward because I need to get home in time for my daughter Daisy's first day of school tomorrow!" On 20 July, the group set out from Tromso, Norway and headed north towards Svalbard, a group of islands which lie midway between the mainland and the North Pole. Image caption Alex Gregory said it had been an "extraordinary month"
A day later they reached the island. Its only inhabitants are Norwegian Armed Forces personnel, and a small number of people working for the Norwegian Meteorological Institute. Fiann Paul, captain of Polar Row, said that despite his attempts, he was unable to get a new crew in to complete the row. "Regardless of that, the project was a spectacular success," he said. "We missed one record but we got 11. "Looking at the entire project I can proudly say that there will be no other ocean row that successful ever again."